I was reading some old posts this morning. I though it only fitting that in light of my husband’s attendance to his first Daddy/Daughter dance this weekend, I should repost this entry. He seriously is amazing. My daughter recently attended a Sweet N Sassy Birthday party. If you don’t know about Sweet & Sassy, then you should be exposed to it at least once in your life. A pink limo ride, glittery make up, dresses and Justin Bieber music. What’s not to love? If for nothing else, but to appreciate the moments in life that do not involve the aforementioned things all in the span of two hours. And what kind of parents would we be if we didn’t document every minute of this unforgettable makeover afternoon? Right? When comparing photos to make sure we had the absolute best of the best shots to show off any chance we get, I ran across the following shot. What is that? 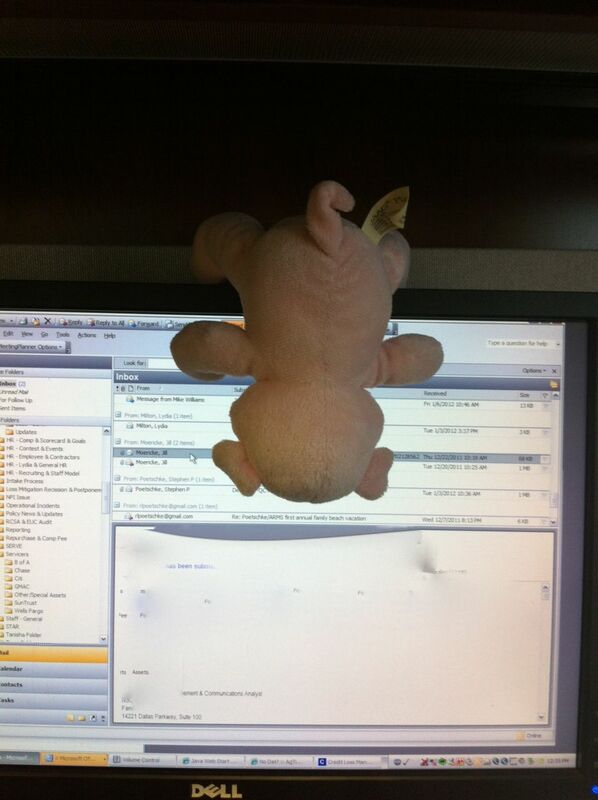 Is that a stuffed animal hanging upside down from a computer monitor? 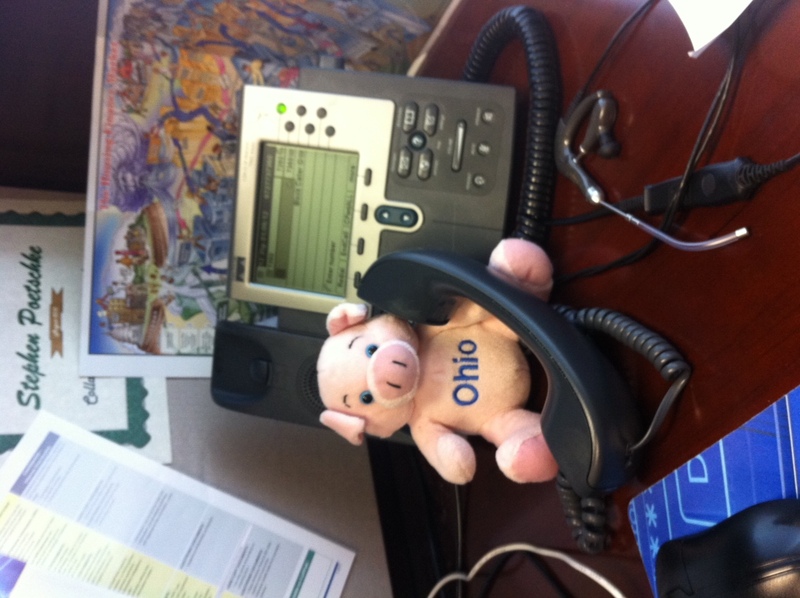 My husband proceeds to explain that our daughter wanted him to take the Stuffed Pig from Ohio to work with him. The fact that he took the pig to work wins him a prize. But that he chose to keep the Toy Story thing alive makes me believe that he’s in the running for the Best Dad Ever award. 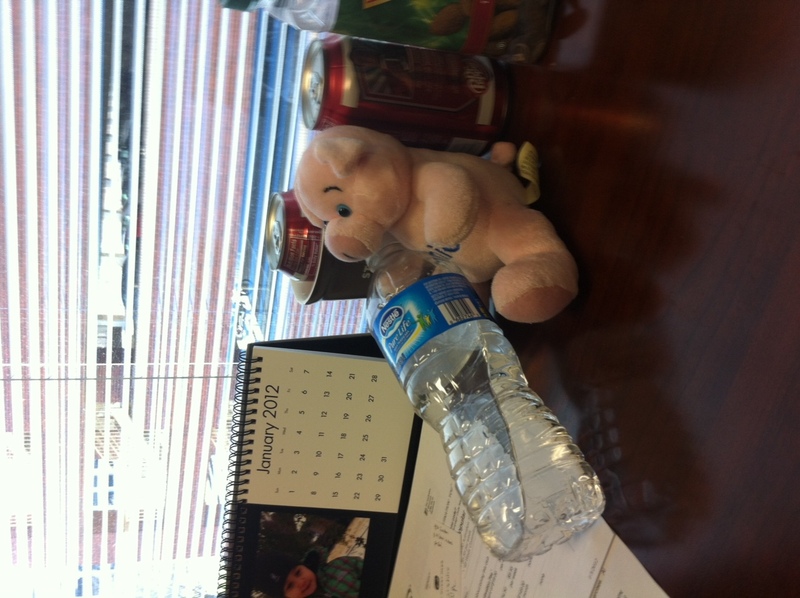 This little piggy drank my husband’s water. This little piggy made some long distance phone calls. Who needs Elf on a Shelf when you have the Pig from Ohio. This entry was posted in Because it's funny, Parenting: AKA - I Don't Know Any More Than You Do and tagged Best parent ever, daddy/daughter. Bookmark the permalink.